New printhead or entirely new printer? Discussion in 'Everything Else InkJet Printer Related' started by inkoholic, Nov 4, 2012. The MG5350 uses four CLI526 and one PGI525. If you buy a set of 521,520 and swap the chips it's as easy to refill as the MP610. You will have to refill more often, though, because of the smaller capacity cartridges. 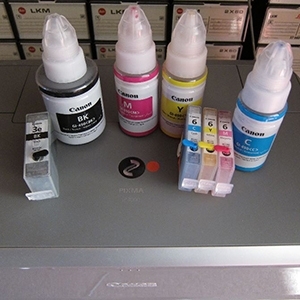 You can find everything you need on octoinkjet. Oh, I forgot: beware of the clearance problem with the MG5350! You will need the low profile plugs if you topfill (I recommend the octoinkjet standard plugs with the skirt trimmed). Given that the MP610 used PGI-5 and CLI-8 (completely transparent) cartridges I'd give some serious thought to a new printhead rather than a new printer but as Tudor pointed out you can recover some of the viewing capability with a chip swap to the 520/521 cartridges (or 220/221 carts depending on where you are in the world). What might swing it for you though is the inclusion of greater network connectivity on the newer models so worth thinking beyond the base printer to wider considerations as that may tip the scales. Thanks . I have one other concern, which might be an electrical problem. 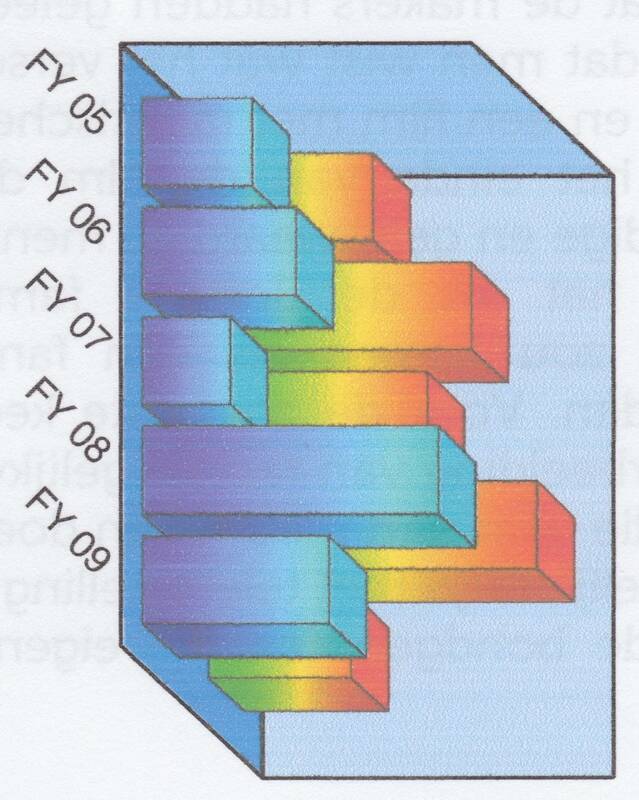 Sometimes no yellow is being printed, and a row (about 1/3 inch thick) without yellow shows up on the paper. It's a perfectly straight "yellowless" line so I guess it can't be a clog. 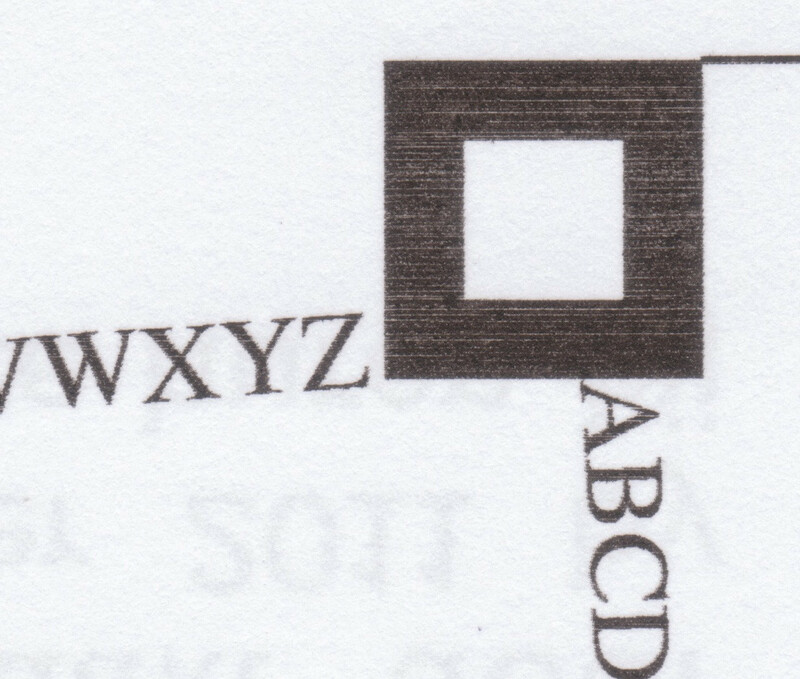 Is this a malfunction in the printhead or in the printer's electronics? If it would be a printer malfunction then a new printhead won't do a lot of good. Also there is sometimes ink starvation of cyan, which shows up as a cyanless line on the paper. This area however has smooth curves so I guess this is not an electrical but a cartridge related problem. I'm having a hard time deciding what to do. Suppose I buy the new printhead, will print quality be "good as new" again? I know it may be difficult to answer. Here is a closeup of 2 prints, 1 pigment black and the other dye colour. Can you post a normal nozzle check so we can look at the quality of your output please..? I'm no expert in these things but if I were you I would be buying a new printer. The age of the printer & the problems you have is a risk thinking a new printhead might fix it as the printer can have other electrical faults internally. The Hat posted this showing what printers are easy or hard to refill. I think your only problem may be build up of dried ink on the bottom of your print head. 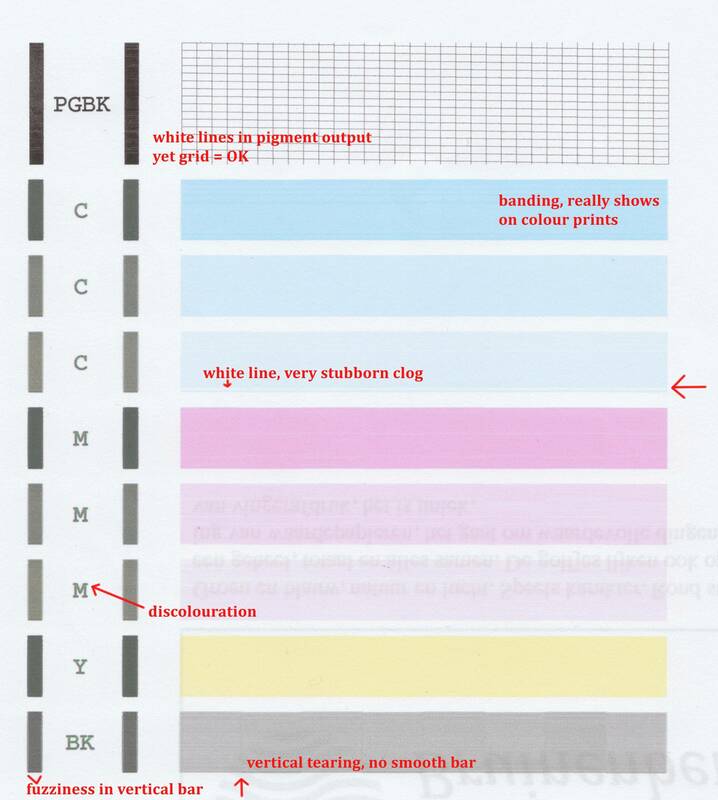 For example, the white lines in your pigment grid are likely a result of the ink being ejected in slightly the wrong direction for some of the nozzles. You can see in the grid printout that they are not all evenly spaced. The vertical tearing in the dye black at the bottom is normal. There are two sets of nozzles that are repeated back and forth across the bar and you're seeing where it switches from one set of nozzles to the other set. Some of your other issues may also be explained by ink build up. I suggest that you remove all your cartridges and then the print head and without tipping it over, blot the bottom of the print against a paper towel soaked with Windex or other window cleaner or just plain water. Don't leave the print head out of the printer too long or you can get ink drying in other places. Your problem with the yellow not working at all is probably electrical and hopefully removing and reinstalling the print head might make for better electrical contact between the print head and its carriage.